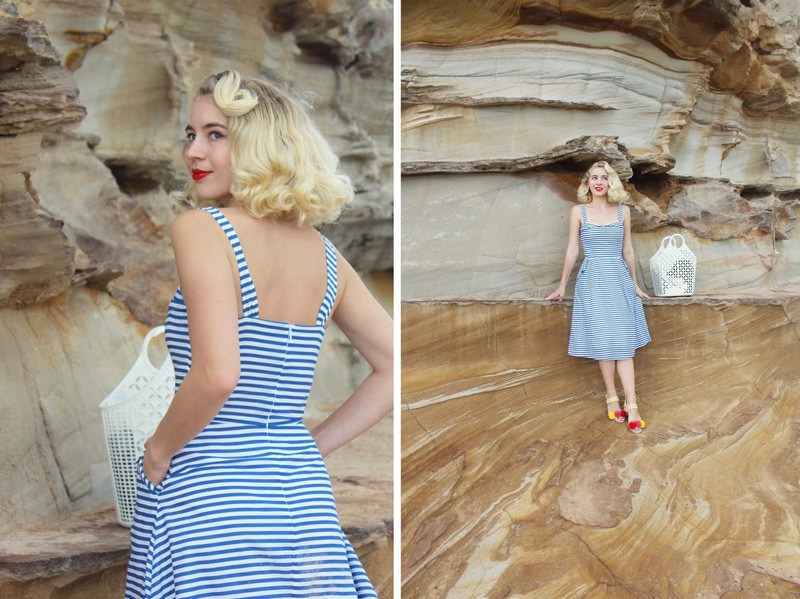 A couple of weekends ago I went to a local boot sale with my dad, I bought a few vintage sewing patterns and then we had fish & chips at the beach. I wore this summery outfit and even though it did rain on and off it was rather warm. Emily and Fin has become one of my favourite brands the past couple of years and I always look forward top seeing what designs are on offer each season. Living in Australia I can't go past a trusty sundress and this lightweight cotton dress is perfect for summer. I am wearing my usual xs and the sizing is pretty much like every other Emily and Fin dress I own but maybe just the slightest bit tighter, but not that uncomfortable tightness that stops me from wearing it. The Pippa dress also has pockets which is always a good thing! This brand also has some really lovely rayon fabric dresses another favourite fabric of mine to wear during spring and summer. I'll be featuring another dress by this brand soon so be sure to keep an eye out. I could style this dress many different ways but my new favourite summer heels with classic summer stripes was the winner for me this time! 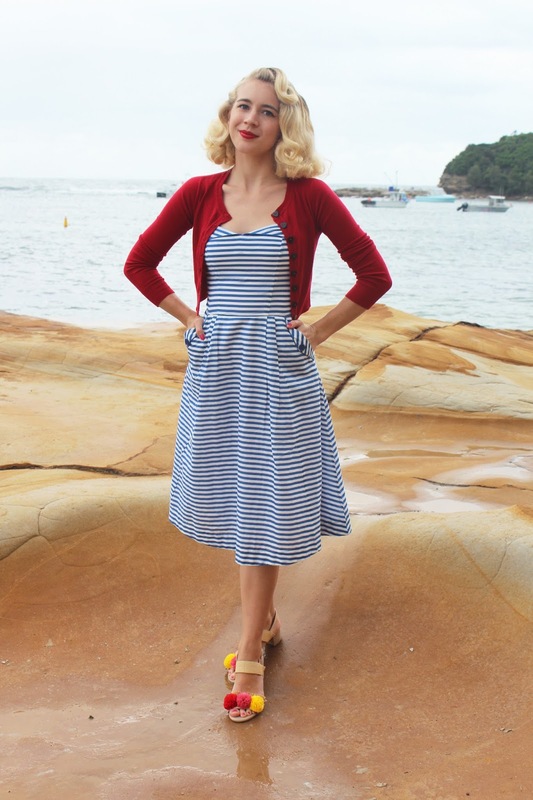 I always like to carry a cardigan in my bag and this Collectif cardi finished off this beach look whilst keeping me warm when the cool breeze hit. I was so upset when these shoes sold out in my size online and at my local store but I managed to score them super cheap and brand new on ebay so I was over the moon. They will go with a good portion of my summer wardrobe and I'm just glad that that I was able to wear them at least once before it's too cold. I just can't get over the raffia and colourful pom poms, so perfect for summer ahhh! It's the Easter long weekend and I spent most of the day sewing and doing some household chores. Hopefully I can get out this weekend in some of my outfits I have been wanting to wear all week as it looks like it is going to be a nice sunny weekend! So pretty! I love how you styled the dress with those super cute shoes! So cute and fun! Love the shoes!